Good news! With the help of some great people, I was able to provide subtitles for the recording of my talk at the 28c3 conference. You can watch the video on youtube and switch on the subtitles as explained in the following screenshot. Just click on the “CC” button at the left bottom of the video. If you have any problems viewing the video, please let me know. Also, I highly appreciate it if you have feedback for me. Just send me an email or drop a comment here. Thanks a lot! Lovely people help me with my project. This time, I got a french translation of my slides. They were translated by Marie-Pierre (mpbijon@free.fr) and I am very thankful for that! She says it is so far just a draft, so if you find any errors, please let her know so she can correct it. Update: Marie-Pierre asked me to mention that she had great help from people from the project http://libre-et-accessible.org/ with her translation. The final video of my talk at the 28c3 is available now. I am working on the subtitles. Stay tuned! Please give feedback on the talks page! As promised, I provide the slides of my talk “Bionic Ears” at the 28c3 hacker conference in Berlin. I also offer a version with detailed speaker notes, because especially my hearing-impaired audience might need it to be able to follow. I had to downsample the images in this version to avoid the files getting too big. Please have a look at the “slides only” version for details in the images. 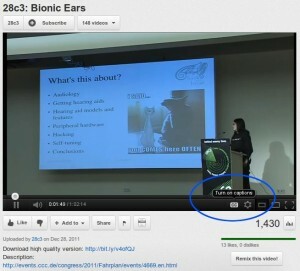 At my talk at 28c3, I played a couple of sound files to show my audience how I hear. The original file is a song “Sad Robot” by “Pornophonique“. This version has the high frequencies removed, which is typical for a hearing loss. Additionally, I have a nasty tinnitus sound in the frequency range which is affected by my hearing loss. The following file has this sampled in. Since the tinnitus sound is similar to a feedback loop’s sound, you are advised not to play it too loud, because it could destroy audio equipment. Update: The video was removed and replace by the final version. You can find that one here. There is a pre-released video of my talk at the 28c3 available on youtube. If you watch it, please give feedback on the talk’s page.! If you watched my talk at 28c3, it would be really nice if you use the feedback form on the talk’s page. Both, positive as much as (constructive) negative feedback is highly appreciated! You can watch the internet streams from Saal2: http://28c3.fem-net.de/. As announced earlier, I will give a talk about hearing aids at the 28c3 conference in Berlin. Here is the link to my talk in the conference schedule. A German radio station asked a sign language translator to sign the lyrics of pop songs. Faszinating to watch and hear (if you can).